Black pudding is an English name for blood sausage. It is food made by cooking down the blood of any mammal (usually pigs or cattle) with meat, fat or filler until it is thick enough to congeal (become firm or solid) when cooled. In Great Britain, blood sausage is called Black Pudding. The ingredients include pig's blood, suet, bread, barley and oatmeal. The most common kind of German blutwurst is made from fatty pork meat, beef blood and filler such as barley. Though already cooked and "ready to eat" it is usually served warm. 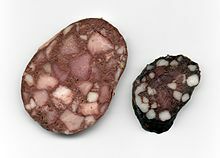 Other kinds of blood sausage include boudin noir (France), boudin rouge (Creole and Cajun) and morcilla (Spain). A legend says that blood sausage was invented in a bet between two Bavarian butchers drunk on the alcoholic drink absinthe during the 14th century. Homer's Odyssey from Ancient Greece says that "As when a man besides a great fire has filled a sausage with fat and blood and turns it this way and that and is very eager to get it quickly roasted...". This page was last changed on 29 December 2017, at 05:06.